The proposed Gateway West Transmission Line Project will span approximately 1,000 miles from the Windstar substation east of Casper near Glenrock to the new Hemingway substation southwest of Boise near Murphy. The maps below reflect the BLM’s authorized routes for segments 1 through 10. Parcel Search: This map is searchable by name, parcel number or address and outlines parcels in relation to the project study corridor. 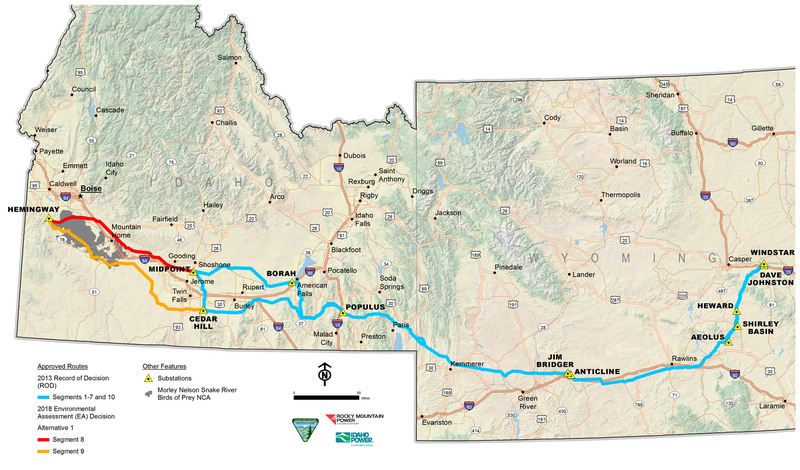 This map shows the BLM authorized routes for segments 1 through 10. Project Overview Map: This map shows an overview of the project area and routes. This map reflects the BLM’s authorized routes identified in the Records of Decision released in November 2013 and the Decision Record for segments 8 and 9 released in the April 2018.